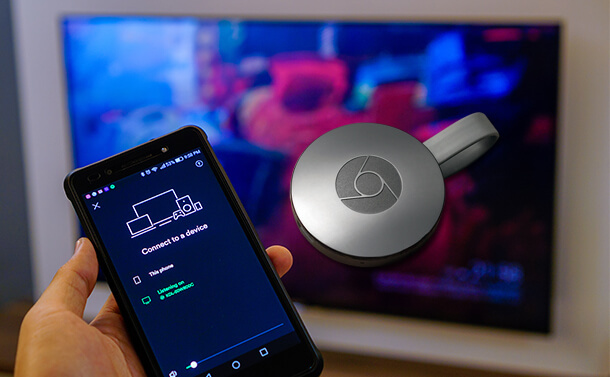 Google Chromecast, as we all know is a fantastic little device, a dongle that lets you watch videos, listen to music and play games on big screen. Apart from this you can do many other things also, on Google Chromecast. For gamers, playing their favorite Android or iOS games on big screen has always been a big thing. Certainly, there are some Android and iOS games designed specifically for Chromecast, but what about other Android and iOS games? Can we play them on Chromecast? This is a question that gamers always have when they use Google Chromecast? To get answer of this question you need to read further and understand few things. Screen Mirroring also known as Screen Casting that is a feature that allows user to mirror mobile content on big TV screen. When a Chromecast enabled game on Android or iOS device is played, players see a split view of the game which is different than screen mirroring. How to Use Screen Mirroring/ Screen Casting? Screen Mirroring/ Screen Casting is a built-in feature on stock Android phones. Users using Google Pixel, Nexus, or any other stock Android phones can easily use screencasting feature. But those using custom Android or iOS will need to use an app for this purpose. Don’t worry we will cover both the topics in the tutorial. Before we proceed on how to play Android or iOS game on Google Chromecast we need to check if all the prerequisites are in line. Android device running Jelly Bean or higher version. Android device and Chromecast both should be connected to the same Wi Fi network. Games on your Android device. Turn off “Power Saving Mode” as it can limit processing power of the device. The “Microphone” permission needs to be granted on Google Home app for successful “Cast Screen/Audio’ feature. How to Grant Permission to Microphone for Google Home app? Scroll down and look for Apps then Google Play Services next Permissions. Here, look for “Microphone” and toggle on to grant permission. How to Cast and Play Android Games on TV using a Stock Android Phone? As, you are using a device which is running stock Android mirroring will be very simple and much resources will not be used either. It’s like a child’s play. Swipe down on the home screen to open notification panel. Next, tap the arrow next to gear icon to unhide more options. Here, tap the pencil icon. Now under Drag to add tiles, look for Cast option. Tap on it, and in the new window that opens choose your cast device. You are all done and will now be able to see mirror image of your phone on your TV. Open the game you wish to play or do anything that you would like to do on a big screen. It isn’t difficult to disconnect a connected device. To disconnect the device connected with Chromecast tap on the Cast icon and select Disconnect. This way you will be able to disconnect the device. If you are reading this section, it means either you are running a Custom Android device or you are an iOS user. The easiest way to get things working is to download and install Google Home app. But as you are using a Chromecast you already have Google Home app. The app is required to set up Chromecast. Next, tap three vertical lines present at the top left corner. This will open a new window that will have screen mirroring menu. On this page you might see a “Not Optimized” warning. Tap OK to proceed. Now tap, Cast Screen / Audio button and select your cast device. You are all set. Now launch a game or do whatever you want to and use see Custom Android device and iOS device screen on TV using Google Chromecast. Now, tap to open menu. Now tap Cast Screen / audio and then Disconnect. Swipe to anywhere on the device home screen to open Notification panel. Next, tap on notification labeled as “Casting screen” here tap on Disconnect. We hope you liked the article and could connect both Android and iOS device. If you face any problem, or want to share a feedback pleat fell free. Also, note as all this takes place on a network make sure you are using a good router and have a good connection speed.